Sometimes we are in such a hurry that we don't take the time to enjoy the unique pleasures that each month brings. In this memorable book of poetry, John Updike looks at each of the months, exploring the sights, sounds, smells, and treats that one can expect at that time of year. In January "The radiator / Purrs all day" and "Fat Snowy footsteps / track the floor" when the children come indoors after playing outside in the snow. In March the weather is "fair" or "raw," and crocuses come up through the earth like "noses come / To sniff around." 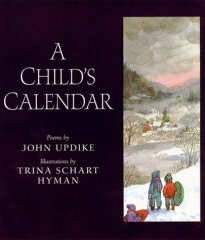 With John Updike's beautiful image filled rhyming poetry and Trina Schart Hyman's lovely wtarecolor paintings, readers can explore a calendar year with a young family, their pets and their friends. The antics of the littlest member of the family are sure to bring a smile to reader's faces, and older readers may find themselves remembering their own childhoods as they share the joys of the seasons with these new friends.